A truck carrying a nearly-complete Tyrannosaurus Rex arrived at the loading dock of the Smithsonian’s National Museum of Natural History just after 6 a.m. EDT, Tuesday morning. The dinosaur had just completed its 2,000-mile journey from Bozeman, Mont., where it was on display at the Museum of the Rockies, and is now on a 50-year loan to the Washington museum. It will be the museum’s first close-to complete skeleton of the Cretaceous carnivore, containing 85 percent of its bones. Fed Ex delivered the bones in 16 carefully packed crates, each sealed with tape and marked fragile, according to the Washington Post. Custom wrap on the trailer, the Post reported, read “Delivering history: The Nation’s T. rex,” next to a painted Tyrannosaurus rex. 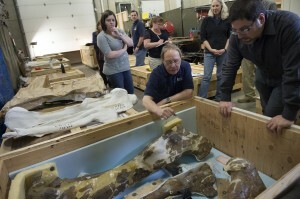 Curators begin unpacking the bones Tuesday. But due to a $48 million overhaul of the museum’s dinosaur hall, which closes for renovations April 28, the T. Rex won’t be on full display for another five years. In the meantime, the bones will be on public view in an exhibition space as they’re cleaned and repaired until National Fossil Day – that’s Oct. 15 – after which they’ll be shipped to Toronto, where the mount is being made, the Washington Post reports.